I’m not sure how many of you know this, but the NCVA is developing a restaurant outreach program whereby we try to encourage and teach local omni restaurants to be more vegan friendly. As part of our restaurant outreach package, I wanted to include a really easy and delicious dessert recipe since, even at the veg-friendliest restaurants, vegan desserts are rare. Check out an article on her win at http://well.blogs.nytimes.com/2010/09/06/tasty-vegan-food-cupcakes-show-it-can-be-done/. Anyway, I’d already tweaked the recipe a bit…a little less sugar, instant coffee because I never have espresso powder…but now I wanted to do a test run with the recipe as a two-layer cake. No big changes required, just needed to find the right baking time. Looking at other layer cake recipes, 350 for somewhere between 28 and 36 minutes seemed the norm. I figured since this was an experimental cake, I’d run another experiment while verifying the bake time. Have you ever noticed how adamant vegan bakers are about not overmixing cake batter? Apparently it leads to tough cakes, fallen cakes, cakes that don’t rise at all, and various other types of badness. But if that’s the case, why do all boxed cake mix instructions tell you to beat the hell out of their batter for two minutes? So I decided to put it to the test. Layer number one was “mixed lightly until just incorporated” while layer number two was beaten violently à la a boxed mix. I baked layer number one for 33 minutes. It fell a little bit, making me think I should do layer number two for 35 minutes. Which I did, and, when it came out of the oven, I honestly thought that it was the winner. It was big and poofy and had a smooth, glossy surface. I envisioned myself calling out all the know-it-all vegan chefs and telling them to stick their light incorporation and accept that fact that, evil omni or not, Duncan Hines has been doing cakes since they were in short pants so if he says beat, dammit, beat! But then layer number two deflated. Here’s a shot of the two layers side by side. The one on the left is the beaten one. Quite the difference in looks! Now on to the icing. 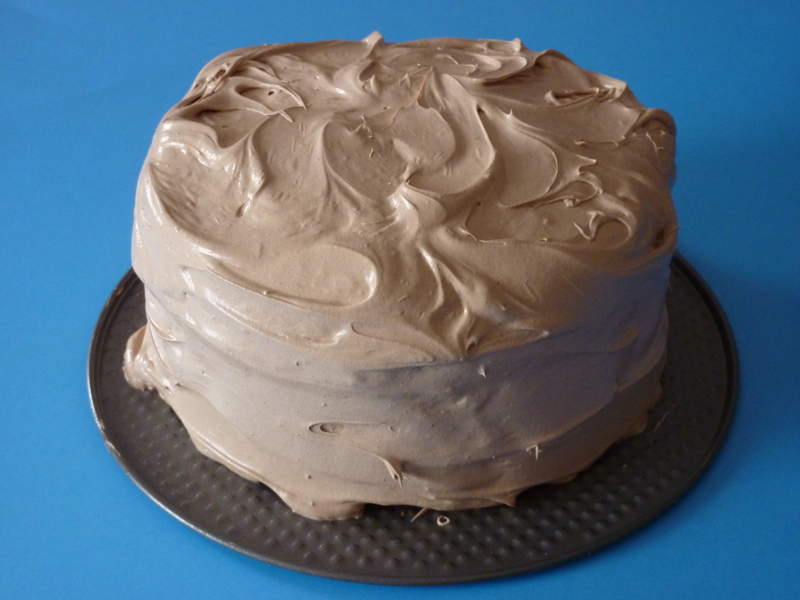 I recently found a recipe for great fluffy vegan icing. Turns out the secret is a pound of fat. Ever notice how often the secret ingredient is a pound of fat? Beat until fluffy (about 5-7 minutes). For a chocolate version, add ½ cup of cocoa. I was planning to go with that recipe. But then I discovered Mimicreme Healthy Top whipped topping. While this stuff is healthy only in comparison to sucking on the tailpipe of an idling car, it is very delicious. Plus, it boasts a level of fluffiness that simply cannot be achieved using traditional ingredients. 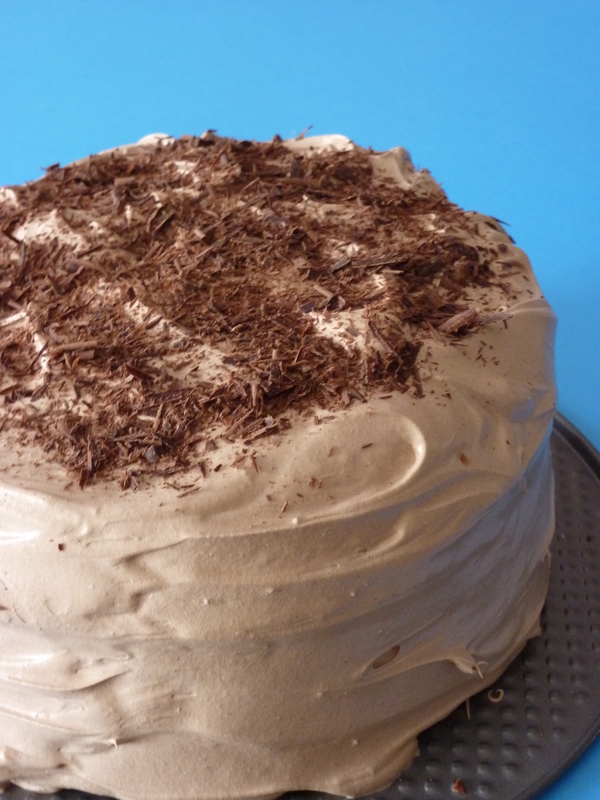 So I decided to try mixing some sugar, coffee and cocoa into the Mimicreme to create a fluffy mocha icing. I began by pulverizing some sugar and instant coffee in my partner’s coffee grinder (I’m sure he didn’t mind), then tossed that and a few tablespoons of cocoa into the unmixed Mimicreme. The stuff looks terrifying just out of the box, by the way. Remember when Tyler Durden retrieved the bag of fat from the liposuction clinic dumpster? Like that, only square. Then I whipped and beheld the miracle that I had created. The stuff was yummy, but seriously weird. First, even though I’d added a good half cup of dry ingredients to the cream, it was runnier than the stuff I’d made on a previous occasion with no additives. How does that work? Second, it was neither liquid not solid. I actually put it in the fridge before putting it on the cake, hoping it would firm up a bit. When it hadn’t changed much after half an hour, I decided to go ahead. I dumped it all on top of the cake, then began spreading it carefully over the edges. I fully expected it to pour over, making unappealing puddles around the base of the cake. But it didn’t. The semi-liquid cream sort of clung to the sides of the cake. I was amazed! Then I decided to tempt fate by trying to smooth out the clinging cream. No way was I getting away with this, I thought. It’ll peel away from the sides of the cake, or start running down, or something. Nope. It was amazingly malleable. I spread, I swirled, I smoothed, and the modified Mimicreme just sort of went with it. It was kind of like the bowling ball mattress – touching any given bit of icing only moved that bit – the stuff around it stayed put. 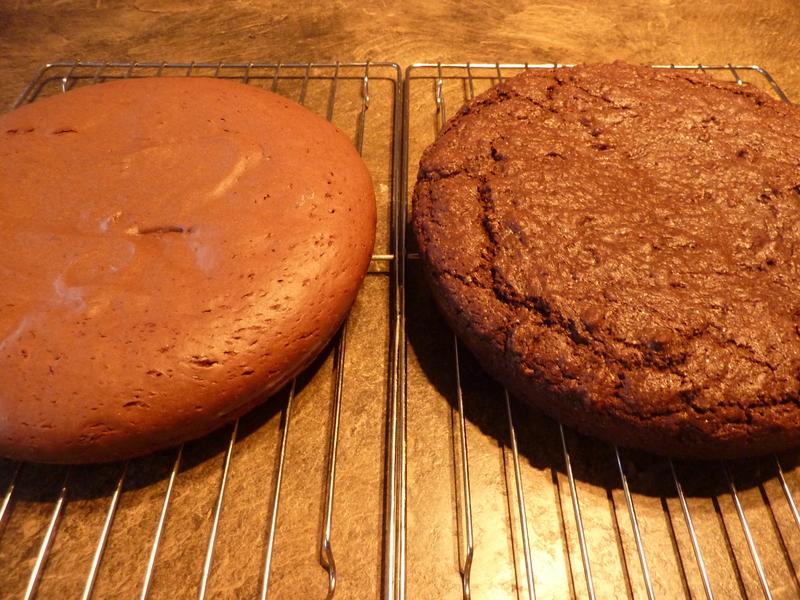 Anyway, here are a couple of pics of the finished cake, with and without espresso chocolate shavings. I’ve got a couple of taste testers coming by later to see if hey can tell the difference between layers one and two. The additions to the Mimicreme were 1/2 cup sugar, 1 tsp instant coffee and 4 tbsp cocoa. The verdict is in…the unbeaten layer is definitely the winner. It had a noticeably lighter texture (and a much richer colour, strangely). So gently mixing just until incorporated is definitely the way to go, all you vegan bakers out there. It’s official.